Visitors of the Museum can now enjoy our new 3D/4D Zable Theater, the first of its kind in Balboa Park! The 3D/4D Zable Theater uses advanced 3D technologies but takes it to the next level of experience; employing interactive seats and unique special effects built into the theater itself. By creating a set of "4D" effects synchronized to the film production, the 3D/4D Zable Theater adds another layer of immersive and experiential fun for audiences of all ages. 4D theaters are a multi-sensory experience and are changing the way people enjoy movies. The 3D/4D Zable Theater seats 36 guests per show, and they are played continuously each day. The Zable Theater is a special exhibition and included with regular admission. Funding for the Zable Theater was provided by the Walter J. Zable and Betty C. Zable Foundation, Cubic Corporation and the San Diego Air & Space Technology Center. 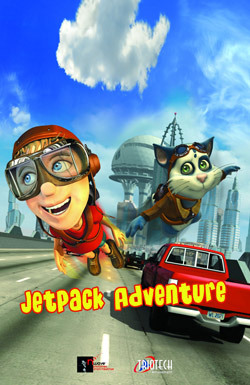 Join Jett, a boy with a wild imagination, and his cat Jin as they snap into their self-made jetpacks and take off to make it in time for school. Feel the adrenaline pumping as you blast off in a hurry. Find the shortest way to class from high up in the sky! Careful! Don't get blown into pieces against those skyscrapers. Outflank those cars as you fly by on the highway. And when traffic gets too rough, try a nifty shortcut underground. Experience the thrills of this explosive adventure and above all, don't be late for school! Welcome aboard as you join a Space Police squadron in a tense "Space Chase" against a ruthless alien thief. On board the high-octane shuttle, you will race through the galaxy at the speed of light. To serve and protect is your mission and failure is not an option. Brace yourself and enjoy the ride of a lifetime! Experience genuine combat with the flying aces of WWI in this breathtaking aerial dogfight over European battlefields. Get ready for a fully immersive space odyssey! Put yourself into the middle of the action for a thrilling ride to the moon! Team up with three teenaged flies and sneak on board the legendary Apollo 11 for a mind-blowing experience that fully engages your senses. Feel your heart pounding during countdown. Can you escape the smoke and fire that suddenly burst out on the launch pad? Grab on to your seat as the rocket boosters blast you off into space. If you make it through the atmosphere, try to relax... Enjoy an eye-popping view of Earth as you float among the twinkling stars. Soon you will find out how it really feels to set foot on the Moon. A sensational breathtaking experience like you've never sensed before.